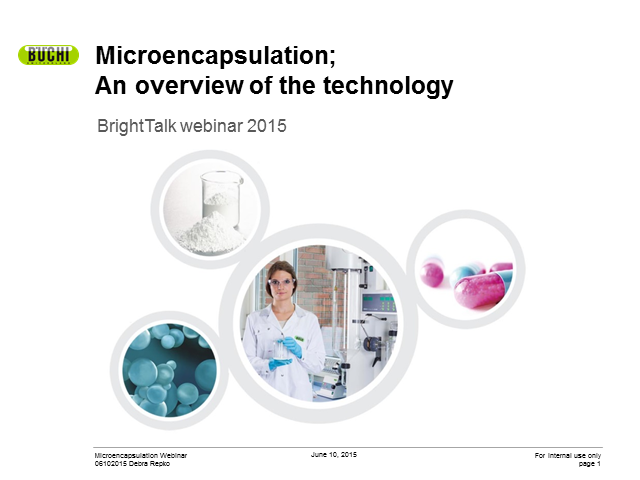 Learn why encapsulation is important and how it can be accomplished with BUCHI products. A complete overview of encapsulation will be presented, from matrix to core and shell capsules. The different types of materials used in spray drying verses those used in prilling by vibration will be reviewed. Application areas to be presented include cells, probiotic foods, and pharmaceutical. Release mechanisms and profiles of the encapsulated materials will be shared. NIR has proven to be a fast, flexible, and reliable method along the pet food value chain; from incoming raw material inspection to in-process and final product testing, see how BUCHI NIRSolutions® can be used to increase plant efficiency, product quality, and profit margins. The cost of solvent disposal can be just as high or higher than the cost of purchasing solvent. Less expensive technical grade solvent can be purified by distillation to achieve the purity necessary for academic and industrial applications. Solvent reclamation, recycling and purification with a BUCHI Industrial Rotavapor® is not only efficient but it pays for itself after one year. Join us to discover ways to better manage or develop your own in-house solvent disposal/ recycling program and the benefits of this type of program. Your environmental testing laboratory is facing harsher EPA emission regulations and competitive sample prices, making is essential to keep up on new technology. The BUCHI Syncore® Parallel Concentrator not only recovers > 95% of solvent but it also provides a crucial competitive advantage. Join this webinar to learn how today’s top environmental testing laboratories are staying ahead of their competition with the implementation of the Syncore® Analyst. NIR is a proven method for quantitative protein, ash, and moisture evaluations important to the flour milling industry. The NIRMaster offers industry-leading robustness, critical to maintain measurement accuracy in harsh environments. NIR has proven to be a fast, flexible and reliable method for raw material acceptance and quality control, leading to immense cost and time savings despite regulations requiring 100% ingredient identity under current Good Manfucturing Practices. Learn how to streamline identity testing, and discover opportunities for gaining product understanding using FT-NIR technology. Discover ways to produce fast, reproducible results when using the BUCHI Syncore® or Multivapor™ products. If you currently use a vortex evaporator or will be in the near future this webinar provides good insight on how to maximize the efficiency of your evaporation process. During this webinar you will learn how to create and optimize your Kjeldahl method with tools such as the KjelCalc App. You will also learn tips and tricks for troubleshooting your Kjeldahl analysis. Introduction to “prilling by vibration” will be discussed. Learn how the new BUCHI Encapsulator can immobilize and protect your products, whether you are encapsulating flavored oil or live cells. The BUCHI M-565 is not just an automated melting point and boiling point product. Several other applications such as slip melting point and melting point ranges can be applied. A guided calibration and verification procedure ensures your results are always accurate. With all the different evaporation technologies today it is important to choose the platform that best suits your application. Whether you are considering a bench or industrial scale rotary evaporator, or a parallel evaporator there are several factors to take into consideration. A single Syncore parallel evaporation system is capable of multiple sample preparation techniques such as concentration, complete solvent removal, and solid phase extraction (SPE). Save time and increase productivity with Syncore’s closed pressure system and unique vortex movement. The use of pressure eliminates the expensive upkeep cost of Nitrogen. Buchi FT-NIR spectrometers provide an elegant and easy method to support your daily laboratory business and can be operated even by non-professional staff after a basic introduction. Despite the speed and simplicity of routine operation, the advanced system administration requires a deeper understanding of the underlying principles. This webinar will discuss the NIRFlex N-500 & NIRMaster including standard software and provide the information required for safe operation and maintenance. Produce encapsulated beads from 150 microns to 2mm with very narrow particle size distribution and productivity up to 6,000 beads/second. Encapsulation of pharmaceutical, food, and microorganisms to cells can be immobilized. The functional principle of the new instrument will be presented and the features and benefits will be discussed. This webinar will focus on the purification of difficult samples using varied loading techniques. Difficult separations made easier with multiple column choices, medium pressure capability, and a UV-Vis diode array detector. Easy customization of fraction collection, external detectors, and system solutions tailored to your needs. This webinar will discuss how Buchi NIRSolutions can help you get more analysis information, higher productivity, higher quality, and better understanding in dairy production. Specifically, the NIRMaster™ is the first dedicated FT-NIR standalone spectrometer with easy-clean design and high ingress protection (IP) to meet the specific needs for at-line analysis in dairy production. Various parameters of dairy products such as fat, protein, dry matter, saturated fatty acids, unsaturated fatty acids, total sugar, lactose, salt and many more can be qualified and quantified. Optimization of your Pressurized Solvent Extraction method is critical in the analysis of environmental pollutants, since analytes such as PAH/Dioxins/PCB/TPH are so diverse. This presentation will cover specific techniques on how to optimize methods for environmental samples such as contaminated soil. Understanding the complete range of industrial scale rotary evaporators and accessories will likely improve your overall process efficiency. Knowing the best glassware option, counteracting a foaming product or how to maximize your throughput will allow you to use industrial scale instrumentation as easily and efficiently as possible. The webinar will build upon the idea of a complete evaporation solution but more importantly how to accommodate many typical environments and issues within industrial scale evaporation. Many dietary supplement companies are turning to near-IR (NIR) as a means of performing rapid and unambiguous ID testing to be in compliance with current regulations. Although NIR is established in the pharmaceutical industry for this purpose, its application in the dietary supplement industry has special challenges. In particular, usually hundreds of raw materials need to be identified and individual materials may possess significant lot to lot variation and yet be similar in composition to other materials. This presentation will cover proven successful strategies that have enabled optimal efficiency in the implementation of NIR, dealing with specific steps such as installation, method development, validation, and routine analysis.